Southwestern Baptist Theological Seminary has a rich and sustained history of Baptist and theological academia. These primary documents, written by the men who established the seminary, offer unique insight into this legacy of education. Courtesy of the J.T. 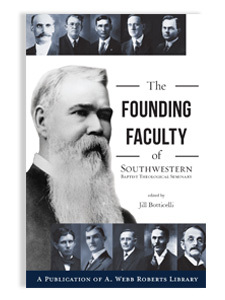 and Zelma Luther Archives, readers will find within this volume biographical sketches and writings of Southwestern’s founding faculty. Writings include lectures, sermons, and journal articles. Jill Botticelli serves as an archivist and special collections librarian in Southwestern Seminary’s A. Webb Roberts Library.